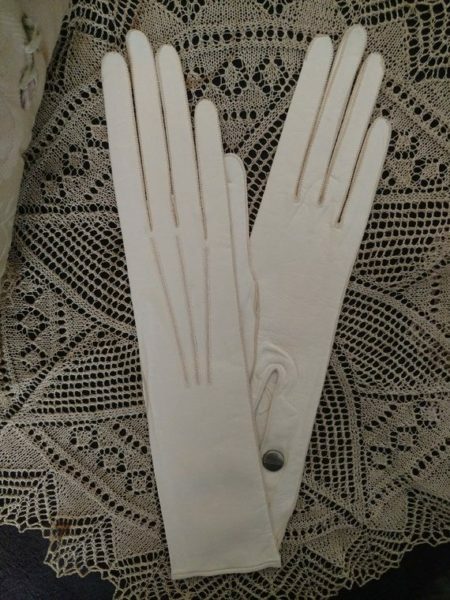 A gorgeous pair of French white leather gloves from the Edwardian – 1920 era. The gloves are unworn,old store stock, still tied together with string and wrapped in the original tissue. Two metal snaps, with Trefousse brand, printed on the snaps. Beautiful and finely detailed with the stitching thread slightly tan in color. The size is small. Mainly these would be for display or carry, unless you would have tiny hands.